paint the rainbows ★彡: Happy (6th..) of July! Hello friends! I hope all my American readers had a lovely holiday weekend. I have been so busy with family, fun, and festivities that I didn't get a chance to post my manis -- but better late than never! At the beginning of the week, when I was first feeling in a 4th-y mood, I did a skittles mani with 2 coats each of Elevation Polish Bohai Sea, a deep sky blue creme holo, Enchanted Polish Stay Classy, San Diego, a pinkish red creme holo, and Lilypad Lacquer In the Milkyway, a whitish creme holo. 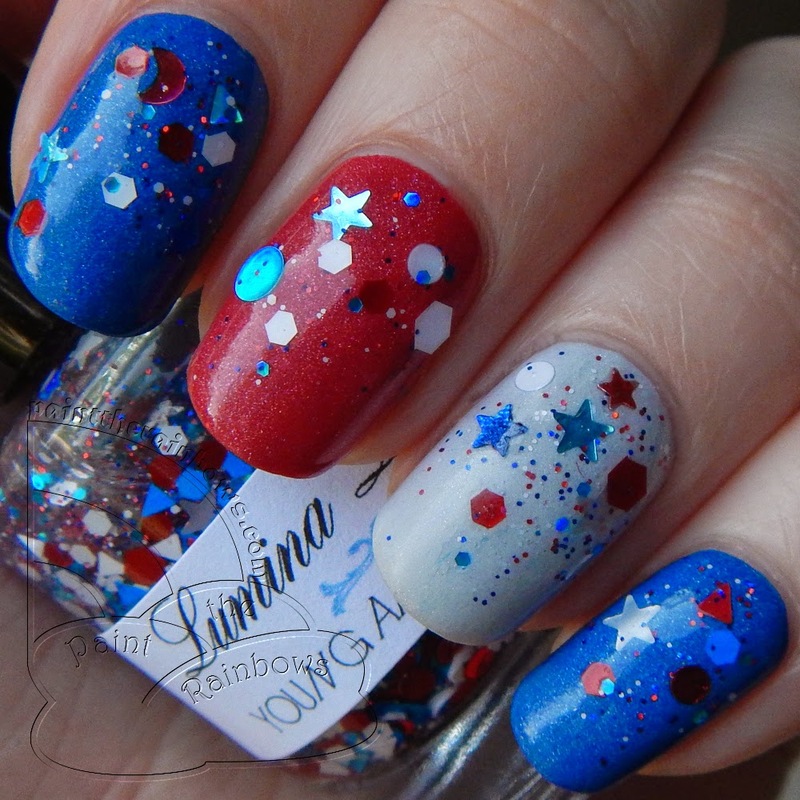 I then topped it all off with Lumina Lacquer Young Americans 2.0, a red, white and blue glitter bomb! This was super fun - a great way to kick off July! For the actual day, I wanted to try some fancy firework nail art. I started with Aly's Dream Polish Patriotic Blue, a blue scatter holo with glitter, Colors by Llarowe Bea Stings, a pinky red glittery holo, and China Glaze Glistening Snow, a silver holo microglitter. 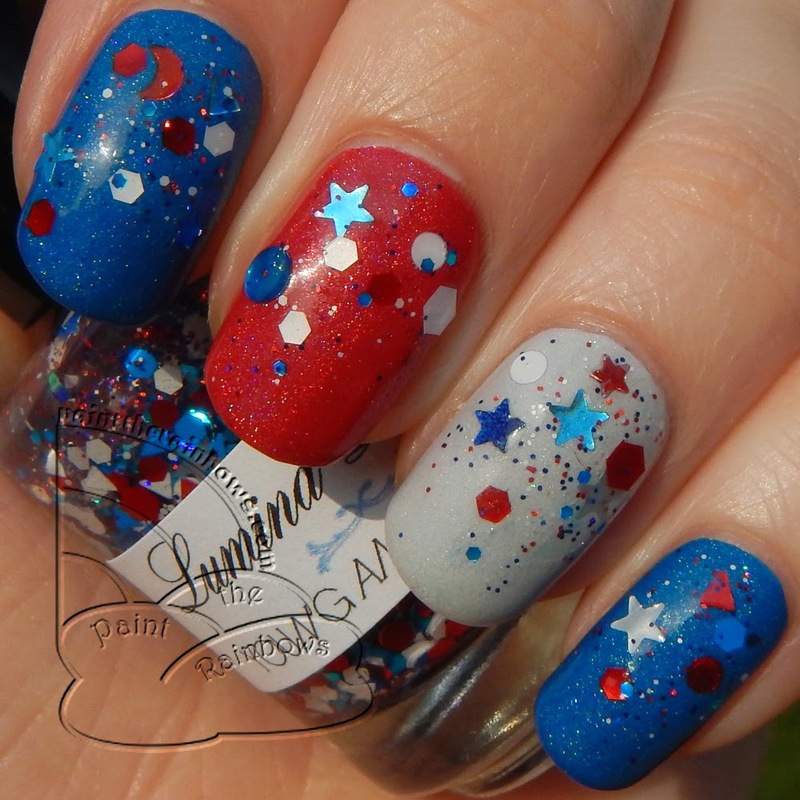 I then used Bea Stings and Patriotic Blue to paint on a firework design (I used my dotting tool like I do for all nail art, because nail art brushes and I don't really get along very well) and put tiny star rhinestones in the center of each firework. I finally topped everything off with Orly Shine On Crazy Diamond, a silver holo microglitter topcoat. I really liked both of these manis! 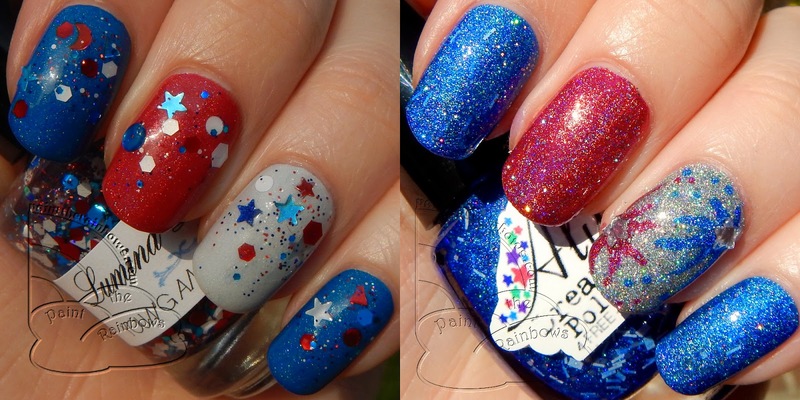 The glitter for the first one was the absolute perfect 4th of July glitter, and blended really well with all base colors without clashing or blending in to any of them too much. And I love trying new nail art designs, so the fireworks were really fun, even if they didn't turn out as great as I was hoping they would, lol. But I got lots of compliments on both and I definitely felt patriotic, so mission accomplished! These are both gorgeous looks!